Jiankou Great Wall has three sections - the northwest section extending 12 kilometers (7.5 miles) from Nine-eye Tower via Beijing Knot, to Jiankou Spot (Arrow Nock); the 3-kilometer middle section from Jiankou Spot to Ox Horn Edge; and the east section with a length of 7 kilometers (4.3 miles) from Ox Horn Edge to Mutianyu. The locals praise the northwest part as the highlight as it is the most beautiful, adventurous and exciting of the three trecking routes. Hereunder is the hiking route and tips for the northernmost part from Nine-Eyed Tower to Beijing Knot. You may take metro line 2 or 13 to Dongzhimen Station and use Exit H to reach Dongzhimen Transit Hub. Take bus no. 916 there at 06:00 to Nanhuayuan Sanqu stop after 2 hours. Then head westwards for 300 meters (330 yards) to find the stop of bus no. 51 which leaves at 08:40 or so. Take that bus for 2 hours to the Sihai stop, and then hail a taxi to the Nine-Eyed Tower (Jiu Yan Lou) Scenic Area at a cost of CNY 30. You can also charter a car from rental agencies in Beijing for this one-day independent Jiankou Great Wall hiking tour of its north section from Nine-Eyed Tower to Beijing Knot. It would cost CNY 800 - 1,000 for a round trip using an ordinary four-seat car. If you are staying at a hotel, you can ask the front desk to help you get a car. It usually takes about 3 hours to reach the Nine-Eyed Tower. From the entrance, you can follow a mountainous road for 2.5 kilometers (1.5 miles) to reach the Nine-Eyed Tower. Then get down from the wall and trek along the path outside the ramparts southwards to detour around a watchtower which is inaccessible if going along the wall. After that, continue your Great Wall hiking along the ramparts to the Beijing Knot to have a full view of the surroundings. After getting downward from the Beijing Knot, you will find a path on the east of the ramparts. Go along the trail downhill to the 5th Team of Xizhazi Village. For your return trip, you may charter a car at Xizhazi village to Huairou Bus Station at a cost of CNY 150 per car, and then transfer to bus no. 916 back to Beijing downtown. 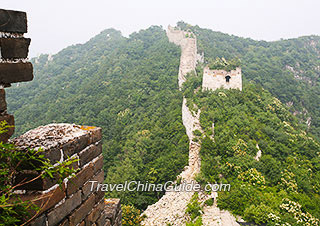 Built in 1543, it is the largest watchtower of the Great Wall of China with nine arrow holes on each side and that is how this Great Wall section got its name. This tower, with an elevation of 1,141 meters (3,743 yards), occupies the highest position among all the remaining watchtowers along the Great Wall in Beijing. You can climb up to the top to have a full view of the surrounding rolling mountains and overlook the faraway Beijing Knot. Great Wall ramparts from north, east, and west confluence at the Beijing Knot. Seated at the highest location of this area, it was built along the nearly vertical mountain ranges and you can get great views of yellow Jiankou Great Wall ramparts stretching up and down away to the distance. 1. 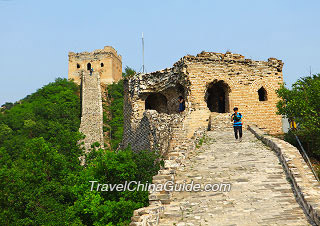 This backpacking tour of Jiankou Great Wall can be a little bit challenging as some parts of steep stairs have already collapsed. You are highly suggested to pick a sunny day and find some experienced companions to do the hiking. Wearing a pair of hiking boots and taking some mountaineering equipment are also recommended. 2. There is an old castle 300 meters (330 yards) to the west of Nine-Eyed Tower, which served as the barrack of the troops stationed there in the Ming Dynasty (1368 - 1644). Covering an area of 4,800 square meters (5,740 square yards), it is the best-preserved Ming barrack originally built together with the Nine-Eyed Tower. 3. You can find a hostel at the 5th Team of Xizhazi Village when you get down from Beijing Knot. The next day, you may extend this independent Jiankou Great Wall hiking tour to the east as there are more spots, such as Eagle Flies Facing Upward, Sky Stair, Jiankou Spot, Ox Horn Edge, and Zhengbei Tower, which are worth a visit as well. If you are a camping lover, you can even pitch a tent at Beijing Knot.